Ice Racing: The Basics | Hupy and Abraham, S.C. Many motorcyclists think that winter is the downtime for riders. And many motorcyclists would be wrong! If you’ve never heard of ice riding, then you’re missing out on a whole new season and style of riding. Though it may seem counterintuitive, motorcycle tires do get great traction on the ice when they’re modified. This is because “ice tires” are embedded with screws (and occasionally spikes) that are inserted in a specific pattern and at a specific angle. Screw lengths vary based on rider preference and racing regulations, and you can make them yourself or buy them premade. It’s highly recommended to get some tire wraps for your tires, as keeping the screw heads sharp is key for maintaining good grip on the ice. This one’s pretty easy … gear up! You’ll be at speed on the exposed ice, and even on “warm” winter days, you’ll feel the bite of the winter chill. Snow pants, snow boots (as long as you can still shift) and insulated gloves work well. Pair a balaclava with a full-face helmet or motocross style with goggles to ensure that your neck stays warm as well. Motorcycle bar covers can be easily purchased through almost any major retailer, and will go a long way in keeping hands warm (while also allowing you to wear less bulky gloves). Even though you’re likely to slide on the ice if and when you go down, it’s still a good idea to wear armor. Hips, elbows and knees are all vulnerable impact points to the hard ice. Approved locations vary by state, but overall ice should be clean and no less than 5-7 inches thick. Most states will have groups online that will post riding locations and even group riding days. Ice riders will occasionally even set up impromptu courses, and sanctioned races are held in winter throughout the season. The law firm of Hupy and Abraham has been proud to represent riders for over 40 years throughout every season. 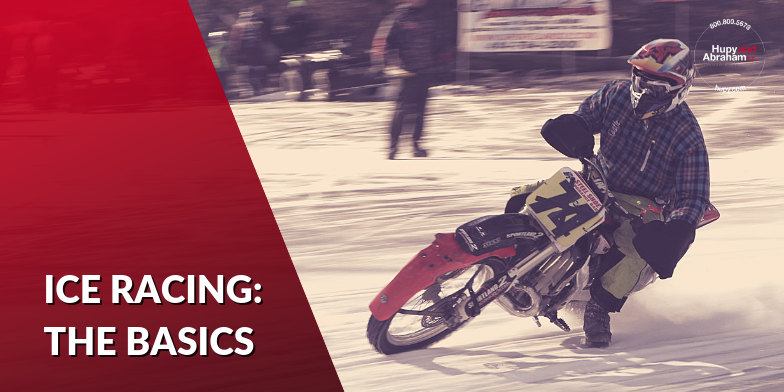 Check out our online motorcycle events calendar to find great ice races in your area, and visit our Behind the Handlebars channel regularly for everything from event overviews to maintenance tips!